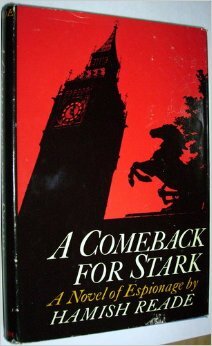 A Comeback for Stark was published by Putnam (1968) and Faber (1969), under the pen name Hamish Reade. A taut, unconventional spy thriller which probes the unglamourous, uncertain, often decadent world of espionage and counter-espionage, by a startling new talent who carries on the tradition of A Dandy in Aspic and The Spy who came in from the Cold. Stark is a seedy, run-down British agent, demoralized after a fiasco of a case, who finds himself used as a pawn by his superiors in a complex game of twisted power moves. The plot centres on Booter, a middle-placed deskman in a subsection of the Admiralty, a homosexual whose affinity for pornographic literature and blue movies makes him an easy victim for blackmail; Myra Harkness, a fellow employee with a taste for masochism, whose personal life is in equally sad turmoil; Stark’s superior, Openhouse, who manoeuvers himself cheap generic xanax into his superior’s position by manipulating the men around him; Lepler, a dangerous foreign agent who attacks his victims by using his immense weight as a weapon; Hornby, lean and elegant, who is highly but vaguely placed in the security hierarchy and has access to every secret; and Stark himself, whose power to kill in cold blood has returned, and who blunders through the case, killing with renewed confidence and diminishing rationality. Through a labyrinth of blackmail, perversion, treble-crossing bosses, and four bloody deaths, Stark emerges as a new kind of anti-hero in this most inventive, farcical, and explosive British thriller. “Hyper-sophisticated, homicidal, nightmarish yet farcical….Mr Reade can write and is often funny.” The Observer, London. “As spy thrillers go, Hamish Reade’s A Comeback for Stark is engagingly eccentric…” Oxford Mail, London.